Which electrode should I use? Choosing the right electrode for the kind of brush plating you intend to do can help you saving money as well as achieve good plating results. If you are silver brush plating using a silver electrode can help your silver brush plating solution last longer, as some of the silver in the electrode is used in the plating process, along with the silver in the silver brush plating solution. 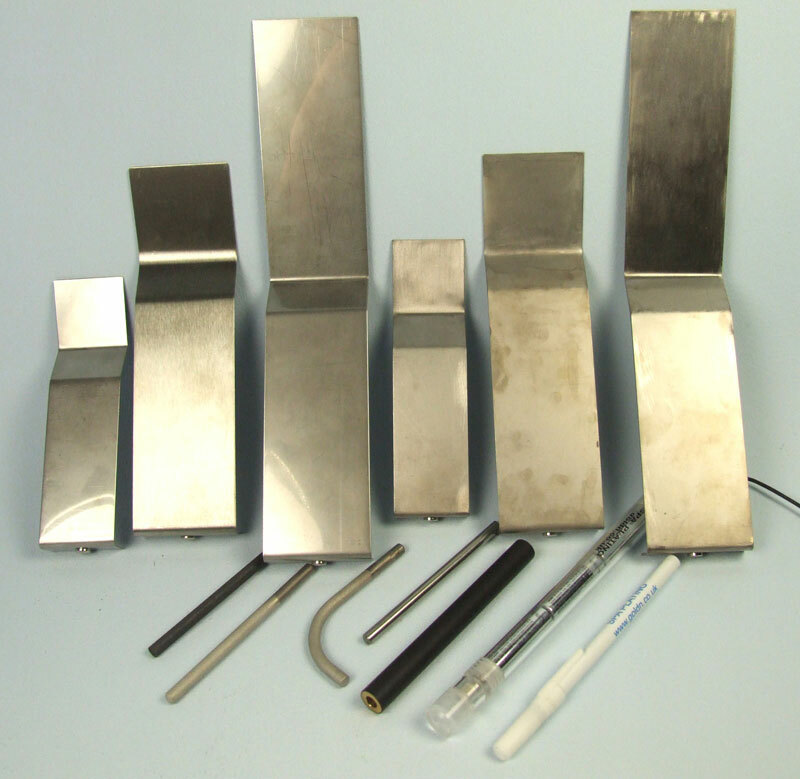 We sell a large range of different electrodes in different sizes. Our Large and Extra Large Flat Electrodes are great for brush plating large, flat areas. They really speed up plating time and help you to ensure you're plating to a high standard. The table below will help you to quickly decide which electrode to use for your selected plating job. When chrome stripping, only the stainless steel electrode should be used. 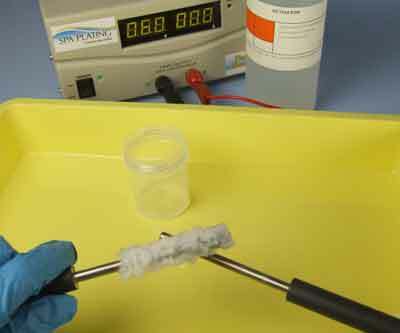 The carbon electrode can be used for a range of plating processes but it will wear out with use and discolour your swab (this hasn’t any effect on the quality of plate). The platinum electrode plates to a very high standard and won’t wear down or discolour your swab. You may find that with regular use and over an extended period of time, some dulling or staining may build up on your electrodes. 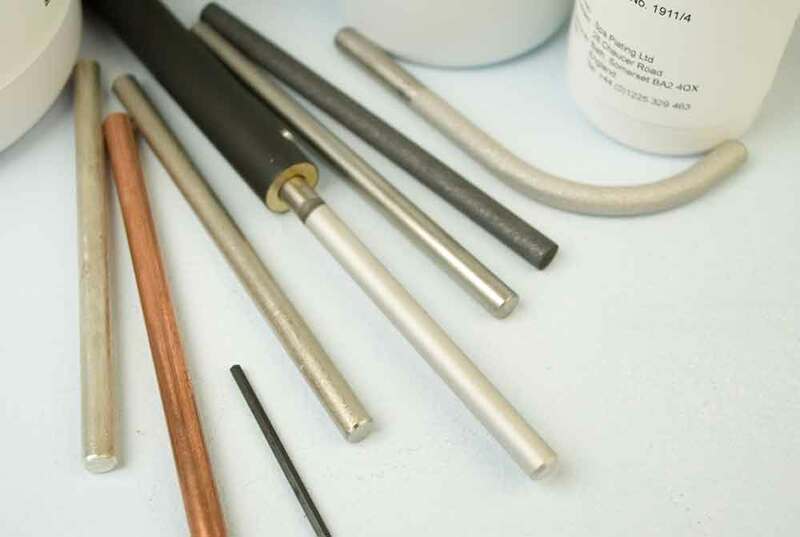 To remove any marks that can’t be easily wiped off, connect the wand handle that has been fitted with a platinum electrode to the red lead and join a stainless steel electrode (with a swab) to the end of a black lead and brush at 5 to 7 volts with ActiClean. Carry on brushing until all marks have been removed. NB Do not use any form of abrasive material to remove dull patches or staining, as this will damage the surface of your electrode and impair plating.